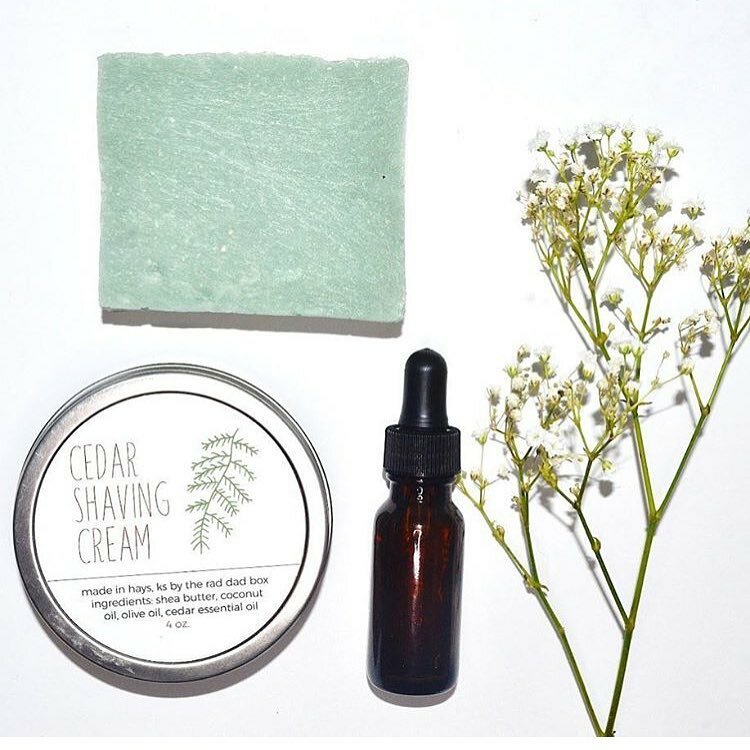 This all-natural men's grooming kit includes: Handmade Bar Soap (Tea Tree and Mint or "Manly Man") Cedar Shaving Cream by the Rad Dad Box (Starter Kits for New Dads and Their Children) Aftershave Oil Ingredients (Aftershave Oil): Organic Argan Oil, Organic Sweet Almond Oil, Organic Hemp Seed Oil, Vitamin E, Pure Lemongrass Essential Oil. Ingredients (Tea Tree and Mint Hair, Body, and Beard Bar Soap): Olive Oil, Water, Coconut Oil, Sodium Hydroxide*, Organic Palm Oil, Shea Butter, Castor Oil, Essential Oils of Tea Tree, Rosemary, Peppermint, Lavender, Chamomile Powder. Ingredients ("Manly Man" Bar Soap): Organic Palm Oil, Water, Olive Oil, Coconut Oil, Sodium Hydroxide*, Shea Butter, Sodium Chloride, Kaolin Clay, Ultramarine, Chromium Oxide, and Fragrance. Ingredients (Shaving Cream): Shea Butter, Coconut Oil, Olive Oil, and Pure Cedar Essential Oil.